This is an intense, gripping novel perfect for fans of Gayle Forman, Jay Asher, Rainbow Rowell, John Green, and Jenny Downham from a talented new voice in YA, Jennifer Niven. 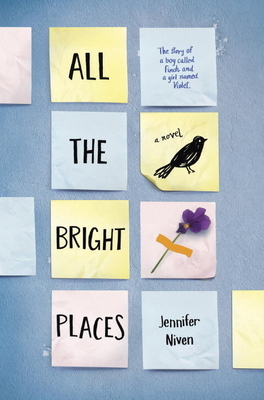 All the Bright Places is Jennifer Niven’s first book for young adult readers, but she has written four novels for adults—American Blonde, Becoming Clementine, Velva Jean Learns to Fly, and Velva Jean Learns to Drive—as well as three nonfiction books—The Ice Master, Ada Blackjack, and The Aqua-Net Diaries, a memoir about her high school experiences. Although she grew up in Indiana, she now lives with her fiancé and literary cats in Los Angeles, which remains her favorite place to wander. For more information, visit JenniferNiven.com, GermMagazine.com, or find her on Facebook. "Ultimately, the book, with narration that alternates between Finch and Violet, becomes Violet’s story of survival and recovery, affirming the value of loving deeply, grieving openly, and carrying your light forward." "It’s touching, vibrant, and an impressively honest depiction of depression."